05/04/17 Regarding Project #7: If your submission produces extraneous text outputs (e.g. you are using System.out.print to trace program flow) you will probably fail lots of the tests. You should never submit a project that produces unexpected output. 05/03/17 Regarding Project #7: Somewhere in the code distribution it mentions public tests, but there aren't any public tests -- this was an artifact from a previous version of the project. Sorry for the confusion. To help you see how to create a fish pond for testing, click this link for an example of a JUnit test that creates a pond and does a simple test. 04/27/17 Project #7 has been posted. This is the last project so start early to ensure that you max out your score on it! 04/19/17 Our final exam will be on Monday May 15th from 4:00PM to 6:00PM. Please plan to arrive at 3:50PM. There are two different rooms, depending on section numbers. IF YOU COME TO THE WRONG LOCATION, YOU WILL BE TURNED AWAY. Check your class schedule carefully to ensure you are going to the right location, as indicated below. Note that section 0201 is not with the other 020X sections. 04/18/17 Some students didn't get Quiz #5 back yet, so solutions have been posted here . 04/13/17 Project #6 has been posted. 04/03/17 The final exam will be on Monday 5/15 from 4:00PM to 6:00PM. The location will be announced later (it will NOT be in our usual classroom). 04/03/17 Project #5 has been posted. 03/15/17 Project #4 has been posted. 03/08/17 There is a way to draw a line at the 80th column in the Eclipse editor, despite the bug which has prevented us from doing it in the past! This should help you to comply with the course requirement of keeping your lines shorter than 80 characters. Click here for instructions. 03/07/17 To see the grader's comments about style in your projects (including an explanation for why points were deducted), go to the submit server. Find the submission that should have been graded and click it. Find the link that says "Code Review" and click that. You should see comments from the grader scattered throughout your source code. 03/07/17 As I mentioned in class, I made a mistake with the due date for project #3 (it should have been due on Wednesday of next week.) I'm going to leave it as it is (due on the 21st), but I will be posting project #4 on Wednesday 03/15. Project #4 will be due on Sunday 04/02, so plan accordingly. 03/03/17 Project #3 has been posted! 02/27/17 Don't forget that the first exam is on Wednesday 3/1 in your discussion section. I posted a new set of study questions that you might want to take a look at before then. 02/18/17 Project #2 has been posted! This project will probably take you significantly more time than the previous one, so get started right away! 02/10/17 Project #1 has been posted! Click the "Projects" tab to see a link to the project description. To request one-on-one tutoring, click this link. If you have a laptop, please bring it to the discussion each time. There will be frequent quizzes and lab exercises (sometimes for a grade). These will not be announced -- you are expected to attend every class session. 01/31/17 Fawzi's office has moved! I am now in room 3265 A. V. Williams building. 01/24/17 Welcome to CMSC 131 for Spring 2017. Note that this website is for sections 010X/020X/030X only. Important announcements will appear here as the course moves along. Be sure to look every day. This is a first programming course for Computer Science majors with a focus on object-oriented programming. The goal of the course is to develop skills such as program design and testing as well as the implementation of programs using a graphical IDE. All programming will be done in Java. There is no required book for this course. There are many excellent introductory books on programming in Java. One that I can recommend is Java Foundations Older editions of this book are nearly identical to the latest edition, and you can find them sold cheaply online. There will be eight programming projects and other assignments to be completed during the lab sessions. Some are considered "closed" assignments which you must complete by yourself and others are considered "open" assignments where collaboration is permitted. (More information about the open policy will be provided in class and can be found in the Policy Regarding Open/Closed Projects.) There will also be two midterms, a final exam, and occasional quizzes. All assignments can be done on the machines of your choice. You are welcome to do the work on a home computer if you have one. There should not be any machine-specific dependencies in your code. If we are not able to run your program because there is a difference between your and our computer environments, you must work with us to get your program to work in our environment. You are expected to use the Eclipse IDE for all programming assignments. 20 points are subtracted from your total if submitted within 24 hours. No late assignments will be accepted after 24 hours. Even if the course is over, do not make your code available to others. Notice we constantly monitor online sources. Note that academic dishonesty includes not only cheating, fabrication, and plagiarism, but also includes helping other students commit acts of academic dishonesty by allowing them to obtain copies of your work. You are allowed to use the Web for reference purposes, but you may not copy code from any website or any other source. In short, all submitted work must be your own. Cases of academic dishonesty will be pursued to the fullest extent possible as stipulated by the Office of Student Conduct. Without exception every case of suspec\ ted academic dishonesty will be referred to the Office. If the student is found to be responsible of academic dishonesty, the typical sanction results in a special grade "XF", indicating that the course was failed due to academic dishonesty. More serious instances can result in expulsion from the university. If you have any doubt as to whether an act of yours might constitute academic dishonesty, please contact your TA or the course coordinator. You may not post the implementation of your assignments, materials related to the class (e.g., project description), or any other material associated with this course. Even if the class is over and you have graduated, you may NOT post any material. Sharing your code or your "test code" with any student. Looking at or debugging another student's code. Make a reasonable attempt to inform the instructor of his/her illness prior to the class. If you are going to miss an in-class assignment then we expect to hear from you (either email or telephone message) before the class session begins. Upon returning to the class, present their instructor with a self-signed note attesting to the date of their illness. The note must contain an acknowledgment by the student that the information provided is true and correct. Providing false information to University officials is prohibited under Part 9(h) of the Code of Student Conduct (V-1.00(B) University of Maryland Code of Student Conduct) and may result in disciplinary action. This self-documentation may not be used for the Major Scheduled Grading Events as defined below and it may only be used for one class meeting during the semester. Any student who needs to be excused for more than one absence, or for a "Major Scheduled Grading Event", must provide written documentation of the illness from the Health Center or from an outside health care provider. This documentation must verify dates of treatment and indicate the timeframe that the student was unable to meet academic responsibilities. The documentation should be given to the instructor, not the TA. We will not accept a "self-signed" note for "major scheduled grading events", as defined below. The note must be signed by a health care professional. It is also the student's responsibility to inform the instructor of any intended absences from exams for religious observances in advance. Notice should be provided as soon as possible but no later than one week prior to the exam. The Department of Computer Science takes the student course evaluations very seriously. Evaluations will usually be open during the last few weeks of the course. Students can go to www.courseevalum.umd.edu to complete their evaluations. All course materials are copyright UMCP, Department of Computer Science © 2017. All rights reserved. Students are permitted to use course materials for their own personal use only. Course materials may not be distributed publicly or provided to others (excepting other students in the course), in any way or format. Students in sections 010X/020X/030X may visit any TA on this list. If you are in sections 040X then you must see a TA who has been assigned to your sections -- see your class webpage or talk with your instructor. All TA office hours take place in room 1112 A.V. Williams. Please note that a TA may need to leave 5 minutes before the end of the hour in order to go to his/her class. Please be understanding of their schedules. Grades Server. This is where you go to see grades on assignments and to get your class account informtion. Submission Server. This is where you go to view your project submissions and to get limited feedback about how your project is performing on our automated tests. Eclipse Tutorial. Eclipse is an Integrated Development Environment (IDE) that helps us to write software efficiently. You will use Eclipse to implement the class projects this semester. See the section at the bottom of this page for specific information about setting up Eclipse. The following web pages provide detailed references to information about Java. Oracle's Java Homepage. This is the place to come when you really need the latest technical specs and downloads. Oracle's Java Tutorial. This page has a number of links to books and web pages about Java, which you may find of interest. Java 8.0 API Specs. This page contains (javadoc) documentation for the Java libraries. It is an excellent reference and you should bookmark it on your browser. In order to complete the projects for this course you must install Eclipse following the instructions in the Eclipse Tutorial. Note that if you install Eclipse from some other source then you will not be able to submit your projects easily! After you get Eclipse installed, you will need to connect Eclipse to your class account. 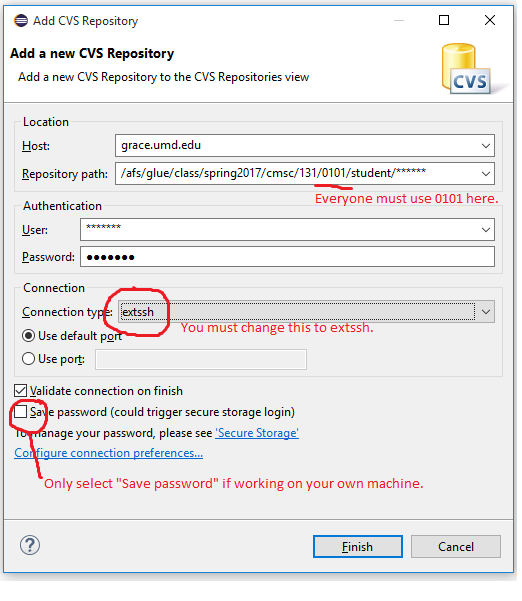 To the right is a screenshot of the information you will need to enter into the CVS connection dialog box during this process. Be sure to change the connection type to "extssh", as shown. Below are collections of questions and practice problems that are designed to help you to learn the course material. These exercises are not being collected or graded. Answers are provided, but please try your best to solve each problem before looking at the solution! The list will be updated as the semester progresses. Disclaimer: Your primary resource for studying should be the notes that you have taken during lectures! There will be questions on quizzes and exams that are not in any way represented in this study list. There will be questions on this study list that are not in any way represented on quizzes or exams. Please be aware that exam questions tend to combine more elements into a single question and many of the questions on the list are simpler than questions you will see on your exams. You may discuss these questions openly with anyone, including your classmates. If you are unsure about how the answer to any particular question is obtained, please drop by office hours for help. That's why we're here! To submit a project, go to the "Java" perspective in Eclipse. Right click on the project folder (e.g., p1) and select "Submit Project" from the pull-down menu. If you do not see the "Submit Project" option then your copy of Eclipse does not contain the class plug-ins. In this case, please see the Eclipse installations instructions on the Resources page, or drop by TA office hours for help. You may submit many times (we grade only the last submission). You can check the status of your submissions by visiting the Submit Server Home Page and entering your University Directory ID and password. Important: Your grade for each project will be based on the greater value of two scores: (1) The score on the very last submission prior to the deadline; (2) The score minus 20% on the very last submission prior to the late deadline (up to 24 hours late). Click the name of a project below to see the project specification.